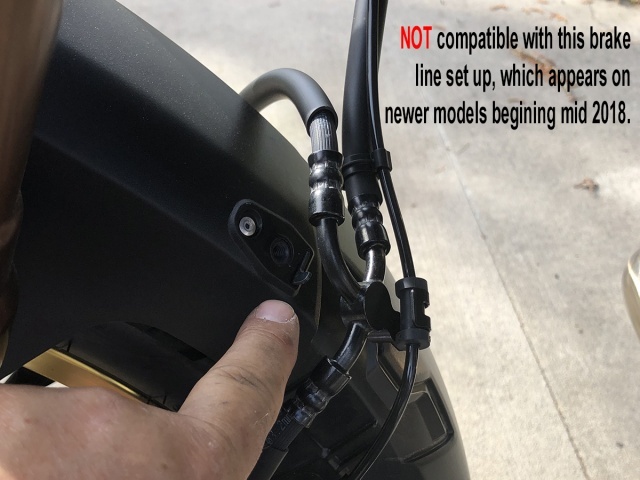 FITMENT NOTE: Honda made a change to the routing of the brake lines mid-2018 which is not compatible with this riser as there is not enough play in the brake lines to cover the rise in height of the fender. If your brake lines are routed and mounted to the fender, as shown in the first image to the right, this riser will not be compatible with your bike. Consider upgrading to the Altrider High Fender Kit for the Standard or Adventure Sports model. Honda’s Africa Twin is a motorcycle designed to tackle any terrain, from sand and dirt to thick, slick mud. However, all that mud and debris can quickly become packed between the front wheel and Africa Twin’s low front fender. AltRider’s High Fender Riser Kit eliminates that issue by giving the Africa Twin’s fender the clearance it needs to truly tackle every type of off-road terrain. Crafted from 3.2 mm American stainless steel, AltRider’s simple-to-install fender riser kit lifts the fender 21 mm higher than the stock position. This height difference can prevent serious accidents, such as an endo or highside caused by a stop in rotation of the front wheel. Even more troublesome, a lack of wheel rotation may result in the fender and brake lines being ripped off the bike, causing a loss of front braking power. The Honda Africa Twin High Fender Riser Kit includes AltRider’s exclusive anti-rotation tabs that interface with the Honda mounting location. These prevent movement of the rear edge of the fender and loosening of the hardware. Our design uses countersunk screws in strategic locations to lessen the stress and interference with the stock plastics. Each mounting bracket is a single piece of stainless steel, with no spot welds to break. Simply put, AltRider’s High Fender Riser Kit allows riders to keep their bikes rolling smoothly - and that’s the ultimate goal.